I keep forgetting, was it winter 2009- 10 that didn't have a ssw, or was it the winter of 2010-2011? Also, what year was it that had a strong ploar vortex, yet a potent easterly still occurred. 2010-11. 2009-10 had a SSW in February. 2007-08 I think you're referring to. I said the same in a post on the previous page, I do think 2010 levels are very achievable though. One of the more forgotten cold spells was that of February 1969 which had decent snow showers and the air minimum temperature got down to as low as -17.1c (and -17.0c on the previous night) on February 17th that year at Claremorris. December 2010's minimum was only -0.4c lower with -17.5c. February 1969 was amazingly around solar maximum and came after a January that was mild but had a negative NAO/AO. November 1968 had a Canadian Warming. A flight of fieldfares just flew over the house (near Glen of the Downs). About 300 birds so I assume migrants. They come down from Iceland and Scandanavia and move quickly ahead of cold weather. Not unknown in August and it's been chilly in Reykjavik recently but quite unusual to see so many I think. 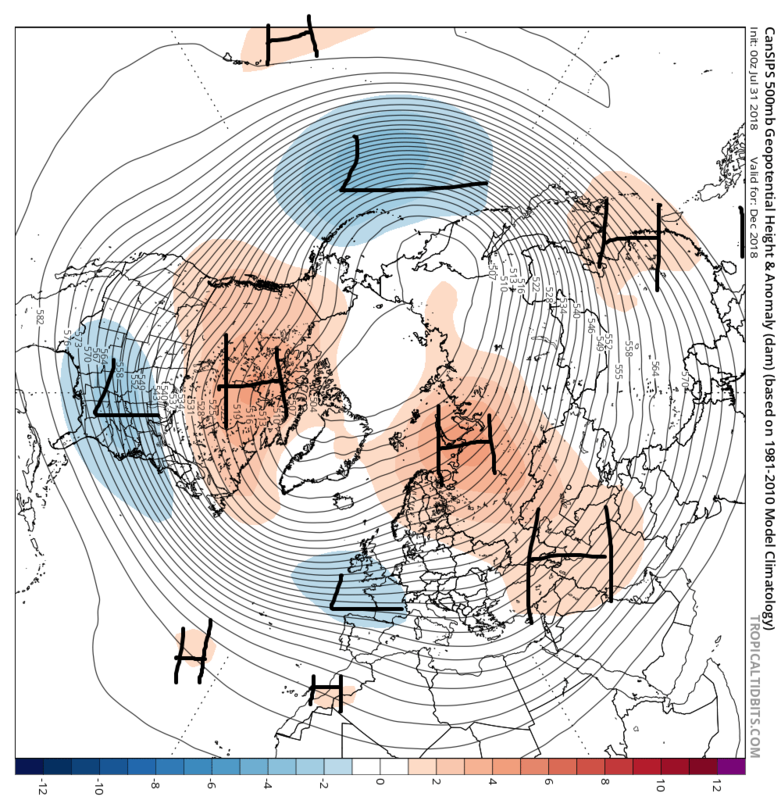 It would be nice to see a lot high pressure and a crispy Autumn and Winter. The surfer's are anticipating a lot of offshore wind and swells this autumn and winter. They seem to be studying the chart's and researching weather patterns like you guys do. I'd love to get back body boarding this winter surf the slabs off the West coast. User name checks out. I think we can trust this guys expertise. Again just for fun but the CanSIPS model is similar in ways to the ECM charts I showed earlier in this thread. Very blocked January and February if this were to come off with extreme cold potential. 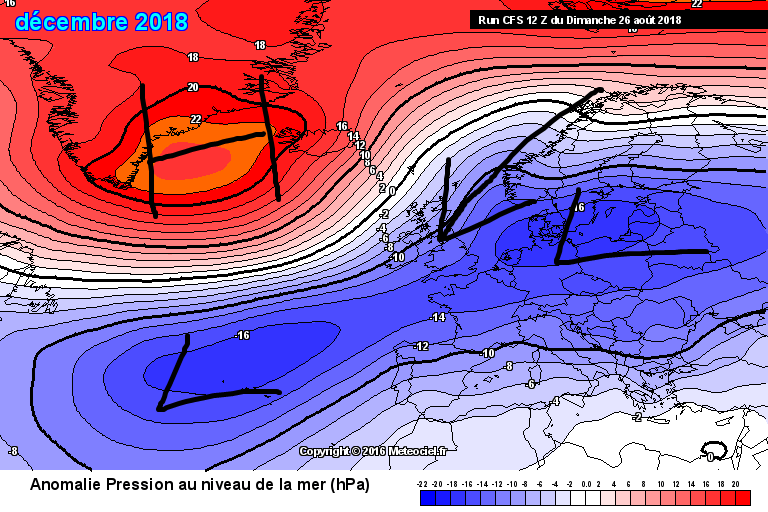 January looks to be very northeasterly and similar in vein to December 2010 whilst February looks very easterly (opens up the opportunities for some Beast from the East type events). 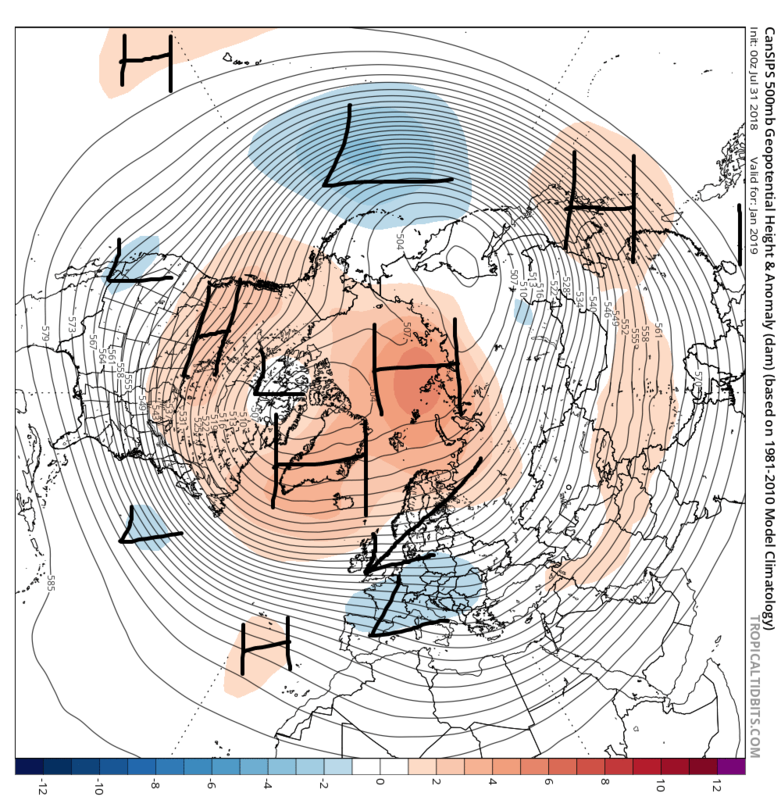 December looks to be a changeable month and is kinda laying the groundwork; see the Siberian High. Last edited by sryanbruen; 26-08-2018 at 19:13. Jezz if those charts were realised , you'd be talking about something akin to the winter of 1962-63. It would be hard to see any atlantic influence for a long time. By the way that post about February 1969 was very interesting. It seems as if the effects of the canadian warming were felt two months later. I wonder what the snow depth at Claremorris was from the snow showers. There are signs of the Atlantic beginning to ramp up somewhat in terms of tropical developments after a very quiet start to the season. Active hurricane seasons can be a good sign for a colder Winter and will explain why soon (maybe later today). Will be closely monitoring the situation. I'll give one quick possible similar year to 2018 in terms of Atlantic hurricanes.... 1978. That was very quiet until September then became an active season. 1978-79 was a really cold Winter with a freezing January though December for the most part was mild and exceptionally wet especially to the south and east. Before I get onto the hurricane post today, wanted to share this chart from the CFS 12z of yesterday for December 2018. That's about as perfect as you can get for cold and snow. It will change but very nice to see and look at. Would certainly wet snow and cold lovers' appetites to the max. By the way, hope you have been enjoying these frequent updates on Winter. Last edited by sryanbruen; 27-08-2018 at 23:10. My favourite thread of the year. An active Atlantic hurricane season is one of the things we look at for Winter as it dumps a lot of warm water in the North Atlantic Ocean which can then be advected into the North Pole and promote northern blocking. 2010 was an active hurricane season. 1995 was an active hurricane season. 1887 was an active hurricane season. These are three examples of years that had active hurricane seasons and were followed by cold winters. However, it's not impossible to receive a cold Winter with an inactive hurricane season, 2009 was such an example and was followed of course by 2009-10. 2009-10 was an a moderate El Nino Modoki and as a result had increased vertical wind shear which led to the inactive hurricane season but as it was El Nino Modoki, we had a cold Winter. El Nino Modoki is very good for cold Winters in the UK and Ireland! The El Nino which is forecast by the models and agencies this year is a modoki and I expect it to be a modoki but there is uncertainty on if it will reach El Nino threshold which is 0.5c or more above average. 1990-91 was an El Nino Modoki but did not reach the threshold though it was a cold Winter with a notable cold and snowy spell in early February 1991. Anyway, I'm going off on a bit of a tangent, thought you'd might like that extra info with this post. The SST profile in the Atlantic we want to see is one like this from 14 December 2009, bands of warm-cold-warm. What is the least favourable for a negative NAO in our current SST profile is the cold anomalies to the south of Greenland, we would want to see them disappear by Winter time and not to mention, the warm anomalies off the coast of America. 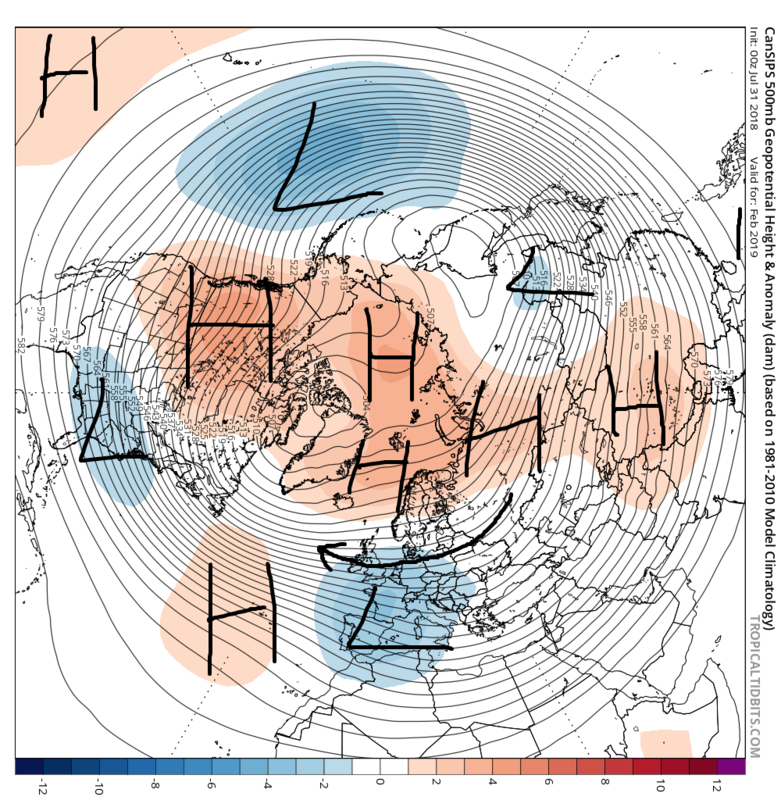 They are two problems with the current state of the North Atlantic which are not favourable for negative NAO especially with a more powerful Polar Vortex as Winter gives. Things can change like they have since May as the Atlantic is more favourable now than it was in May but it's getting kind of late especially as it takes quite a bit of time for the temperatures in the North Atlantic to change unlike say the Irish Sea or the North Sea. Nevertheless, in spite of 1976 being similar to 2018 in terms of the Atlantic SST profile, 1976-77 was a cold Winter with a cold December and January but mild February. 1. It dumps a lot of warm water in the Atlantic Ocean. The warm air is advected into the Arctic to promote northern blocking. During Winter time pre-cold spells, you'll hear "warm air advection" mentioned a lot of the time which is what happened before the beast from the east in February 2018 as high pressure built to the east against the Atlantic. The battle of two brought winds into the south which whilst cold on the surface had warm 850hPa temperatures being advected up to the pole where the southerly winds were pointed at. This gave away to cold air being shunted out the other side of the anticyclonic block over Scandinavia and via easterly winds (helped by SSW) came to us. 2. The warm tropics form one band of the North Atlantic tripole which is explained in the quoted post. This table I have made categorises different Atlantic hurricane seasons from 1914 to 2017 based on the number of storms that occurred. Some maybe swapped to other categories but I think I categorised the seasons well for analogues. 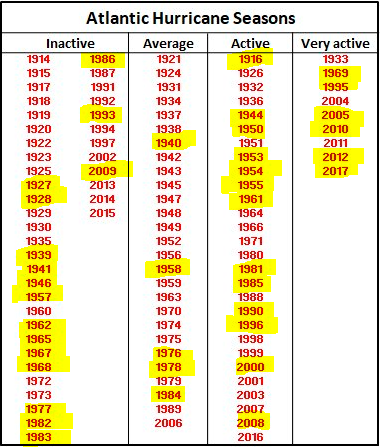 I have highlighted in yellow the hurricane seasons that preceded really cold Winters or Winters that contained a notable snowy/cold spell at some stage. As you can see, there's actually quite a mix to be seen here. 16 inactive seasons preceded such Winters, 5 average seasons preceded such Winters, 13 active seasons preceded such Winters whilst 6 very active seasons preceded such Winters. The latter is notable because there's only 9 examples of very active seasons in this sample space and 2/3 of them seasons were followed by such Winters. Another very active season that comes to mind is 1887 which was followed by a cold Winter. 1978, though ended up average overall (very active during the Autumn of 1978), was very quiet in terms of Atlantic tropical cyclones pre-September with little activity going on. 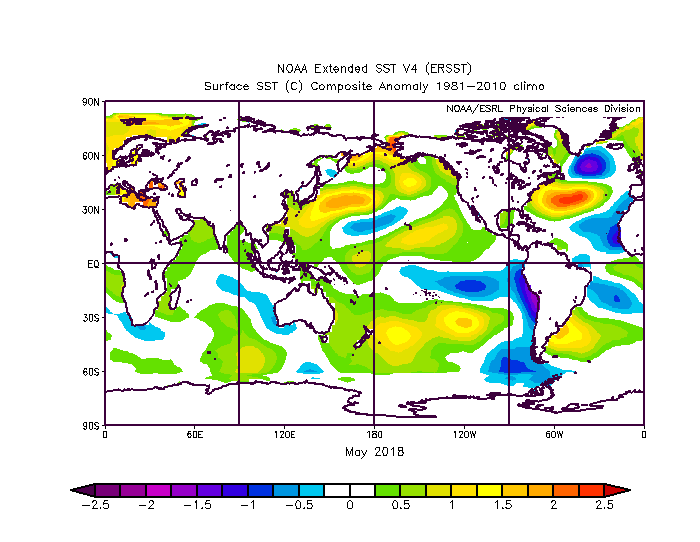 Let's compare the Atlantic SST profiles of May 1978 and May 2018. They have some similarities like the main development region (MDR) for Atlantic hurricanes by Cape Verde near Africa was cold in both years. The Gulf of Mexico is warm in both years. However, in 1978, the eastern seaboard in the US had much colder waters and same with the Norwegian Sea. 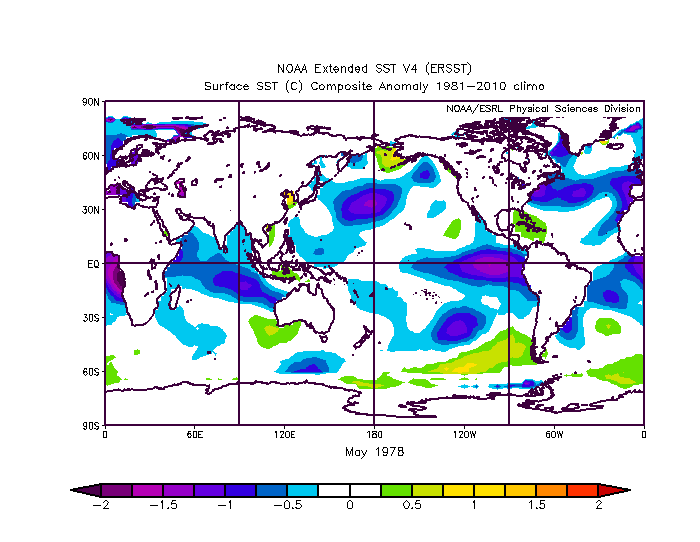 1978's Atlantic SST profile is rather close to a tripole unlike May 2018. The models are picking up on at least 3 tropical cyclones to develop in the next 14 days in the Atlantic Ocean. Why is this happening suddenly after a quiet start to the season? Well we're coming up to when the season usually peaks in terms of developments and also, the main development region has significantly warmed up since May as shown by the graph below given by Levi Cowan. This doesn't look like anything big given the anomaly is close to average but it is a major difference to the potential for tropical developments in the Atlantic Ocean. As you know, the sea surface temperatures in the Atlantic Ocean are one of the biggest issues this year so far for the coming Winter but maybe tropical developments coming up will make a little difference in that. If El Nino does occur, vertical wind shear will increase and the Atlantic hurricane season will continue to be quiet. However, I am getting more and more skeptical about the chances of El Nino occurring this year with the models being biased to warmth. There is still little sign from the ocean right now for El Nino to occur and if one does occur, it's likely to be weak which is the kind of ENSO event apart from neutral that has little impact on the atmosphere unlike say a very strong El Nino that last occurred in 2015-16. Last edited by sryanbruen; 27-08-2018 at 19:27. No definitely fieldfares. Some landed in trees and I got a good look at them. It is very early but not unheard of if temperatures drop fast further North and they've had snow in the ski areas in Iceland over the last few weeks. Im predicting a harsh early winter, significant snowfall before Christmas. Getting seriously stocked up here as we will get cut off often and it would be irresponsible of me not to be well prepared.. Feel like a squirrel !